This thermometer design is anything but ordinary. The grey painted metal base is not flat, but arched and thus achieves a spatial effect. 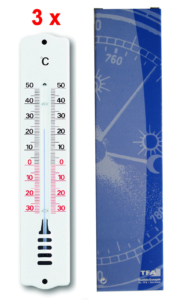 This decorative thermometer is weatherproof and can be used both indoors and outdoors.